Plus analysis of the image. Note: Following the desires of Chimaki Kuori (The Mangaka) While this entry has been written on February 16, it will be published on February 19 the date when the Magazine goes on sale. 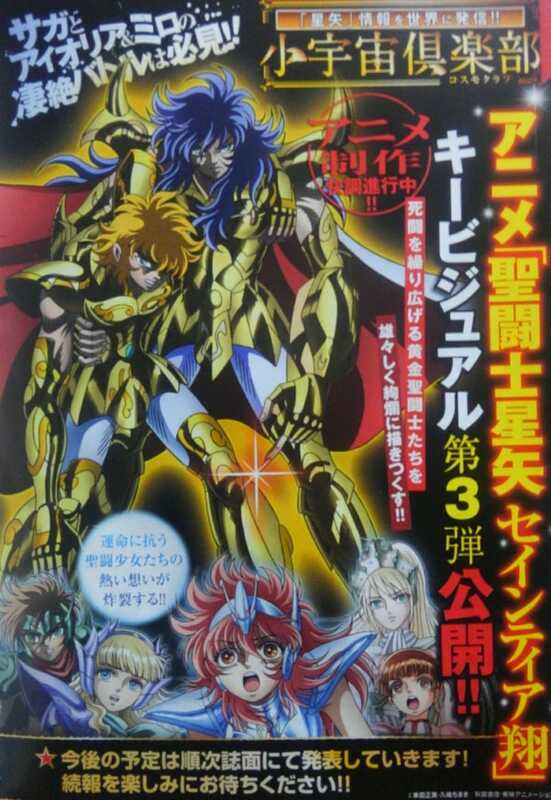 On the pages of the newest Akita Shoten Champion RED Magazine a new visual for the upcoming Anime Adaptation of the manga “Saint Sieya: Saintia Sho” on this image we can see the Scorpio Gold Saint Milo and the Leo Gold Saint Aioria; while bellow there are the 5 Saintias: Equuleus Shoko; Ursa Minor Xiaoling; Dolphin Mii; Casiopeia Elda; Corona Borealis Katya. Now the position of both Gold Saints is very similar as the one they held when they faced Evil Saga back at the Battle at Eris Sanctaury temple (the third Story Arc) so it makes me think that the anime will cover the first 3 story arcs and maybe the manga on it´s entirety depending if Chimaki gives to Toei her notes or something; but that´s especulation. Other point is that unlike the previous visual now we can see Milo´s hair more clearly and it is the same color as he had on the anime, different to the manga where he is blonde. The Image makes mention of the battle that both Milo and Aioria had against Saga in the Saint Sieya: Saintia Sho´s Manga plus the regular announcement that the anime is still in production.